The Atlanta Falcons is an American football team that is based in Atlanta, Georgia. The team is a member of the NFC South, a division of the National Football Conference (NFC) in the National Football League (NFL). The team joined the NFL in 1965 and has been a member for more than 45 years. The team is known for its compiled record of 275-400-6 as well as division championships in 1980, 1998 and 2004. The Falcons have made only one appearance in the Super Bowl, which was in 1999. When the Atlanta-Fulton County Stadium was built, the city thought it was the time to pursue a spot on the professional football scene. Coincidentally, the NFL was looking to expand its fan base in the South and to get a franchise there as well. The Atlanta Falcons were conceived on June 30, 1965, and Rankin M. Smith, Sr., who was then an executive vice president of Life Insurance Company of Georgia, was granted ownership by then-NFL Commissioner Pete Rozelle. Smith reportedly paid $8.5 million for the exclusive rights and ownership of the team. Julia Elliot, a high school teacher from Griffin, Georgia, suggested the name Falcons in a contest held in 1965. Tommy Nobis, a linebacker from the University of Texas was drafted in the first draft of 1966 and became the first ever Falcon. The Atlanta Falcons’ first NFL season was 1966. They lost nine games that season before finally winning its first franchise game against the New York Giants, 27-16. The team won its first ever home victory against the St. Louis Cardinals. By the end of the 1960s the Atlanta Falcons had secured only 12 wins. The team participated in its first ever Monday Night Football game in Atlanta in the 1970 season but didn’t secure its first win until the 1971 season. The Falcons entered their first playoff series in 1978 and won the Wild Card playoffs, where they played against the Eagles but then lost to the Dallas Cowboys in the Divisional Playoffs. The team finished 12-4 in 1980 but again lost in the Divisional Playoffs to the Cowboys. The 1982 season was cut short because of a strike, but the Falcons made it to the playoffs where they lost to the Minnesota Vikings. Coach Leeman Bennett was subsequently fired because of the loss. The Atlanta Falcons did not make it to another playoff game until 1991 when they lost to the Washington Redskins in the Divisional Playoffs. 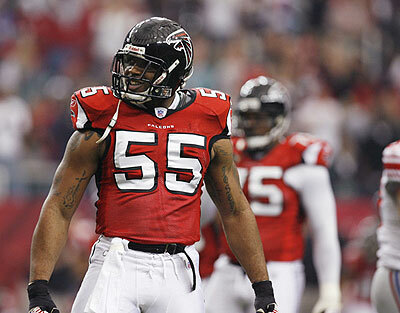 The nickname “Dirty Bird Falcons” was then coined for the team. The 1998 season proved to be the team’s greatest season to date, with quarterback Chris Chandler and running back Jamal Anderson leading the team to one victory after another. The Falcons won 40-10 over the New England Patriots, breaking 22 consecutive losses. The Atlanta Falcons finished with a 14-2 regular season and the NFC West Division Championship. The team beat the Vikings at Minnesota in the NFC Championship game on Jan. 18, 1999, with a score of 30-27 in overtime; however, the Falcons lost to the Denver Broncos in Super Bowl XXXIII. Among all major American football team, the Atlanta Falcons held the most number of seasons without consecutive wins. The streak was broken in season in 2009 when they defeated the Tampa Bay Buccaneers 20-10 in the final game, which improved their record 9-7.